Six 12V batteries seen at the rear of Onkar's nEV provide a 2kWh 72V pack. Talmale is a resident of Dattawadi and studied at Dharampeth High School.His father runs a small stationary shop. "I have wanted a vehicle. For the last two years, I have been saving pocket money as I wanted to invest it in something that I would create on my own. Eventually I got the idea of developing this car," said Talmale. 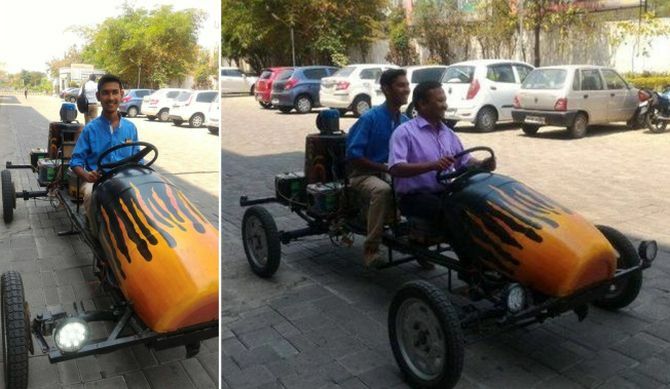 He has named this car, which took him about a month to develop, 'Hirkani'. It can seat two persons. In the creation of his 'Hirkani', Talmale has used a 200 litre broken water drum lying waste at his home as the bonnet. Two old buckets have been used to make the seats. "Its maximum speed limit is 50km/hour. It takes two units [2kWh] of electricity to charge it completely. It has enough battery backup to run for about four hours in one go," Talmale said. The car has two front and two rear lights, and is 10 foot long. It weighs around 200kg. About two months back Talmale made a trip to Amravati and back. "We covered the 150km distance in about 4 hours and 20 minutes. We took a break of 20 minutes during the drive. The journey was completed as we had planned, the car ride was smooth, and it required no charging in between," he added proudly. 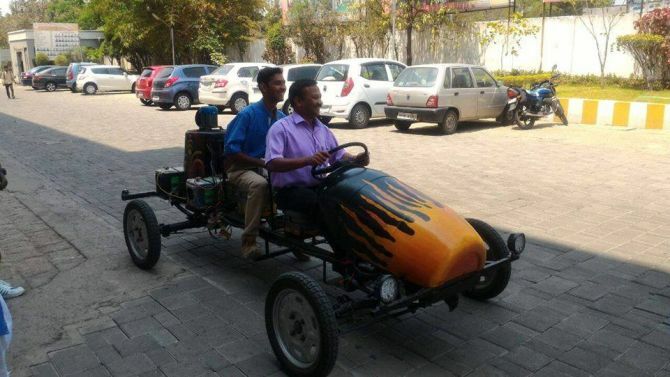 Summary: Eventually I got the idea of developing this car," said Talmale.He has named this car, which took him about a month to develop, 'Hirkani'. 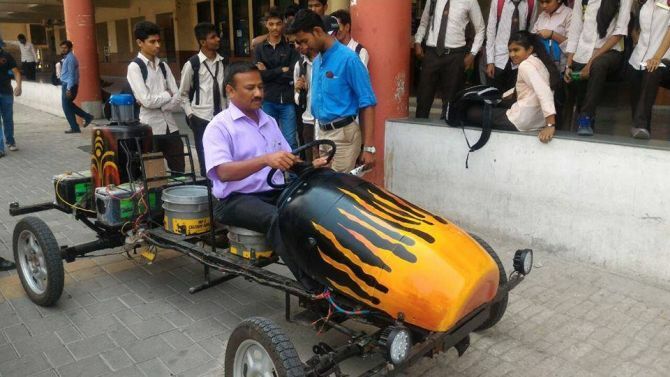 He made the eco-friendly car out of sheer interest and diligence. The journey was completed as we had planned, the car ride was smooth, and it required no charging in between," he added proudly. The chassis has been made out of scrap iron rods and pipes. Nagpur: What can one create using a broken plastic drum, a couple of buckets, and a few pieces of scrap iron rods and pipes, all of which were thrown out as garbage? How many indian units of power does a 100 watt bulb consume in 1 hour?